We are still exploring “Birds”. I’ve selected this week the White Ibis. Back in the 1980’s I had a retail store called, Ibis gifts and jewelry. The shop was located on the corner of my local shopping village in Oakland, CA. When I decided that I was going to open a retail store it needed a name. I wanted to use the name of an animal or a flower. I briefly considered the flower Trillium. A Trillium is a tri-flower perennial herb that is part of the Lily family. I was looking for a symbol to use as the logo. I finally chose an Ibis to be my store’s symbol. The logo was two Ibis heads looking into the future. They were framed by an arched window with the words Ibis gifts and jewelry written below. I loved the curved beaks of the bird design. We had wooden exterior signs made and painted the birds in flight high on the tall long wall of the store. Like cranes, herons and spoonbills the Ibis looks quite graceful in flight. 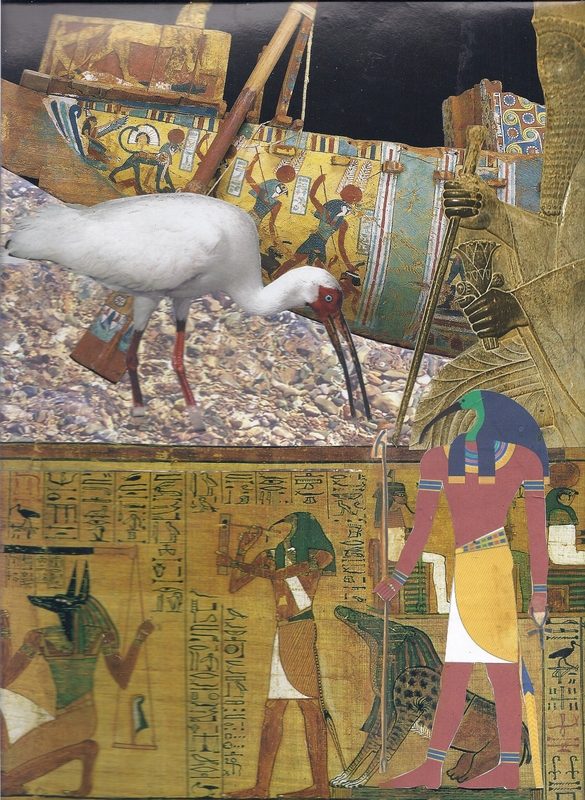 In my collage I have a white Ibis and the Ibis headed Egyptian god Thoth. Thoth is the god of knowledge, hieroglyphs, wisdom, the moon and magic. In nature the long-legged birds wade in shallow water, their long down-curved beaks searching the mud for food, usually crustaceans through they also eat snails, small lizards, flies, crickets, beetles and grasshoppers.. Most Ibis nest in trees. The word Ibis comes from the Greek/Latin and probably ancient Egypt. There are 28 different species. I took a field trip to the San Francisco Zoo to visit the Ibis that live in Northern California. 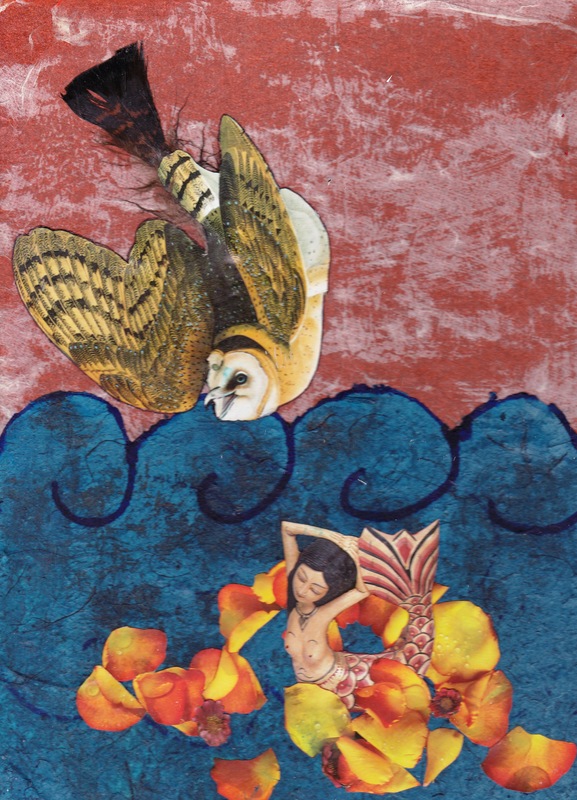 In Steven D. Farmer’s book, “Animal Spirit Guides” the Ibis is listed as a bird that reminds you that everything is sacred. Call on Ibis when you want to “Follow your heart and trust in its wisdom.” Ibis seem to know when weather will turn bad. When a storm is brewing, the Ibis are the last to leave the shore-line and the first to return when the worst has passed… If an Ibis is part of your life “Keep your eyes, ears and heart open in order to notice the miracles around you each and every day.